William Shakespeare! Elizabethan London and the Globe Theatre! Theatres were new - the very first theatre in Elizabethan London was introduced by an Elizabethan entrepreneur called James Burbage and was aptly called 'The Theatre'! The Globe was built from the timbers of the 'Theatre' - William Shakespeare and his company of actors helped with the construction! The Globe Theatre was an amazing success! There was money to be made from this new and exciting form of entertainment. The audience clamoured for more and more new plays. The content of each of the different website sections about Globe life are described below - instant access to fast facts and information! The plays written by Elizabethan Playwrights, such as William Shakespeare, were in great demand. Great actors like Richard Burbage, Will Kempe and Edward Alleyn became the Superstars of the Elizabethan era and the audiences of the theatres, including the Globe! A day out at the theatre was a real event - the design of the theatre was magnificent, based on the design of the old Roman Amphitheatres! Find out more about the history, design, construction, audience, plays, actors and playwrights who made the Globe life and theatre the most exciting place to visit in London during the Elizabethan era! Information about the Elizabethan theatre provides a great insight into the Globe theatre. 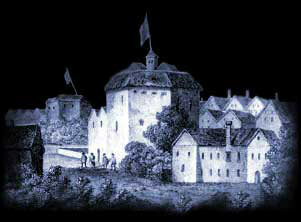 The History of the Elizabethan theatre - the Inn yards, amphitheatres and playhouses. Where were the sites of the most famous examples of the Elizabethan theatre. Check out our map which provides an unusual perspective on the Globe Theatre and the location of its competitors and the Elizabethan Theatres in London. Who and why was the original Globe Theatre Destroyed? Click the following link for facts and information about the history of the original Globe theatre! Click the following link for some interesting pictures and images of the theatre! Click the following link for details of the famous Elizabethan and Globe Theatre actors and their lives! Click the following link for history, facts and information about the audiences of the Elizabethan era! Click the following link for history, facts and information about the New Globe theatre reconstruction! Click the following link for history, facts and information William Shakespeare and he Globe theatre! The Globe Theatre and Shakespeare are synonymous with his great plays. There are so many plays and characters that the following summaries of each William Shakespeare play has been added to this section. Many unusual and interesting pictures of play characters have also been included on these pages.